Laughs come in twos with America's favorite comedy team! 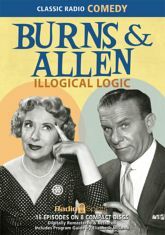 Here comes George Burns and Gracie Allen in sixteen illogically logical half hours featuring a parade of guest stars, including Frank Sinatra, Clark Gable, and Cary Grant! Bill Goodwin, Tobe Reed, and Meredith Willson are on hand as George and Gracie find themselves tangling with madcap matters of crime, competition, money, and matrimony. This 8 CD collection features rare episodes and rare talent!